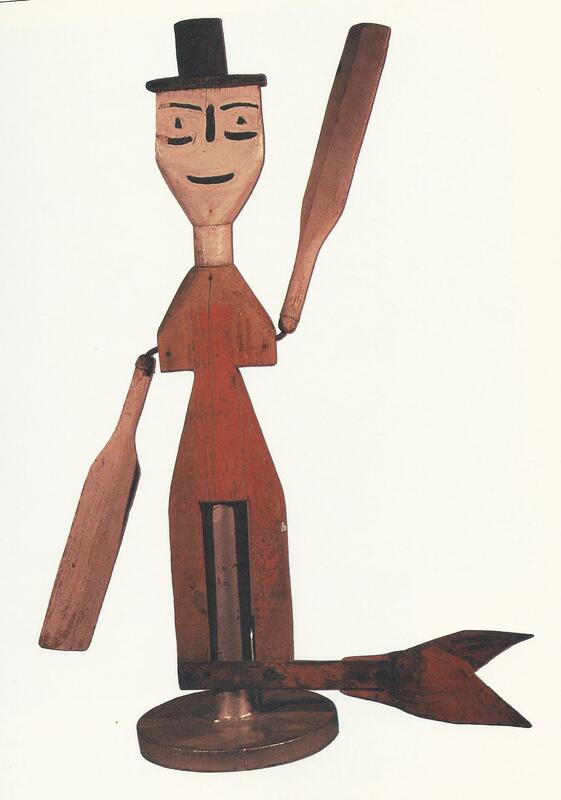 It is a significant, and useful contribution to the appreciation of folk art, when an inspired and knowledgeable individual or individuals put in the enormous effort necessary to survey and document the folk art and artists of a region. It doesn’t happen all that often. Especially outside of Nova Scotia where folk art has become established, and is promoted as a significant part of the cultural mosaic. Read, tourist dollars. Follow the money. 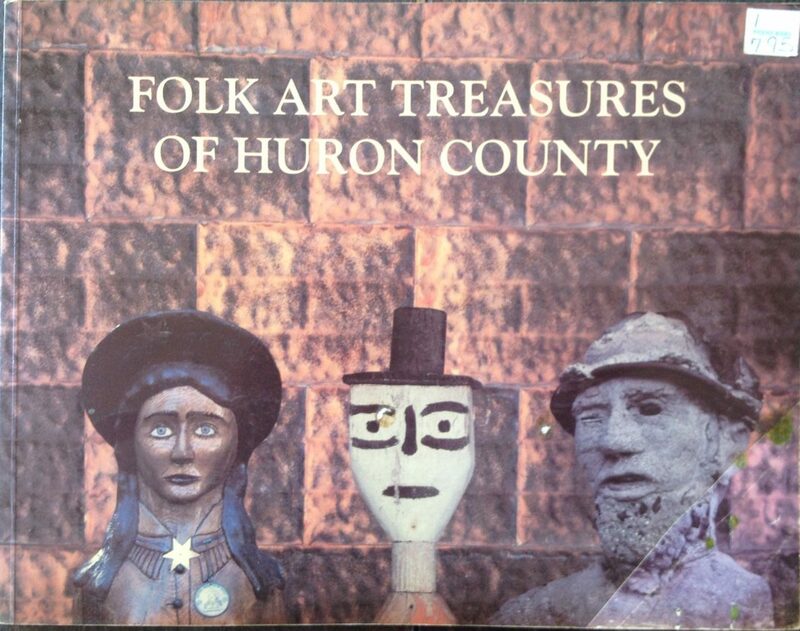 So I was delighted a few years back to find in a used book store, a copy of the catalogue for the “Folk Art Treasures of Huron County” Exhibition, which took place in 1991 as a part of that county’s sesquicentennial celebrations. The event had three components; Contemporary Folk Art at the Blyth Festival Gallery, coordinated by Bev Walker , Historical Folk Art at the Huron County Museum, coordinated by director Claus Breede , and as a third component documentation and a map of the Immovable Folk Art of Huron County, coordinated by John Rutledge. You can imagine it was a monumental task to pull all this together, but this group did an excellent job. In the acknowledgements coordinator Bev Walker thanks over 25 people for their contributions. She also thanks the Folk and Native Section of the Ontario Arts Council for generous financial support. I hope the province can still find a few bucks for such things, what with the deficit and overspending, and all. The contemporary section along with several examples of the work, has three pages of artist’s bio’s which is a great reference tool. I have bought many pieces by Bud Oke over the years and always appreciated his particular humor and talent, so I was delighted to know his story and see his picture. 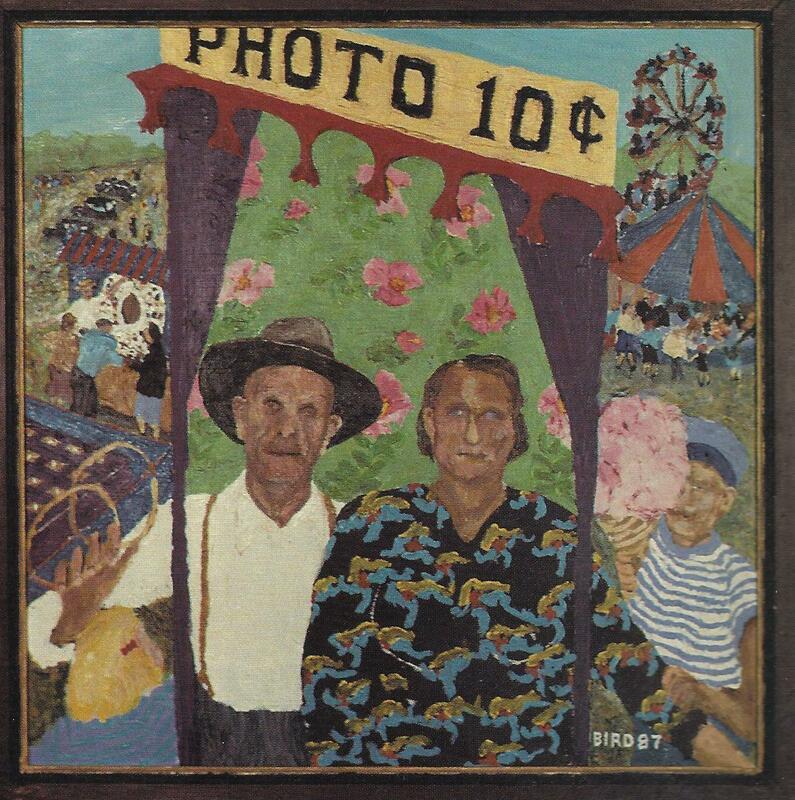 I think Ray Bird’s “Mom and Dad at the Russell Fair” is somewhat of a masterpiece and I would love to see more by this artist. His address is listed as RR#2 Brussels so he shouldn’t be that hard to find, but it also states he was born in 1929 so he’s 88 if he’s still kickin’. Could well be for that matter, and maybe painting better than ever. I’m pretty certain that Stuart Taylor, born in 1908 isn’t available for comment, but my goodness isn’t his Annie Oakley just the best? Yikes! 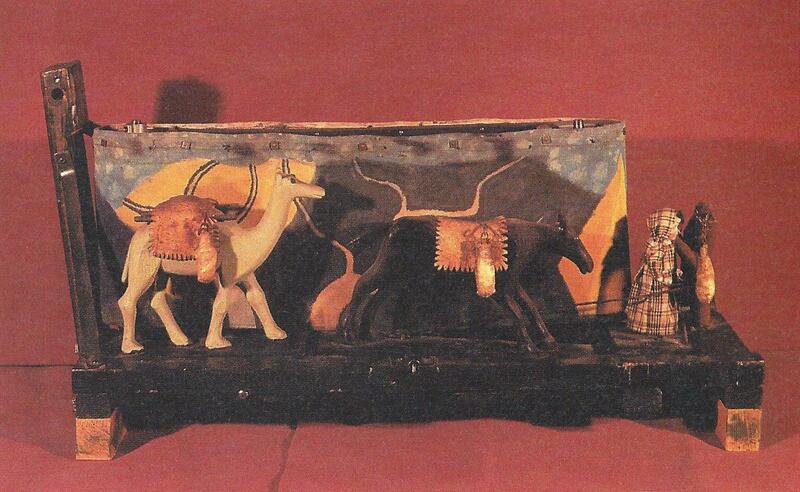 The historical folk art section of the catalogue is also full of wonderful things dating back to the 1850’s. Of particular interest are many working “models” depicting the lifestyle and technology of an earlier generation by Herbert J. Neill. These “gems” are in the permanent collection of the museum, and so still available to be seen today. It’s on my list. However, I’ve got to say that of all these wonderful things Janis and Peter Bisback’s early 20th century weathervane really pushes all my buttons. Happy face on one side. Sad on the other. Peter and Janis still have a big barn full of wonderful antiques in Huron County, and are serious collectors. Worth a visit when you are in those parts. For me, perhaps the most interesting and unusual part of this publication is the third section “Immovable Folk Art”. 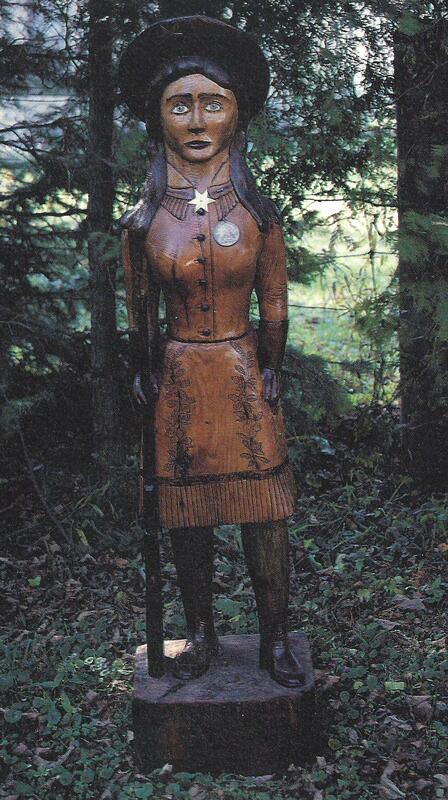 For the most part, we take outdoor folk art for granted. 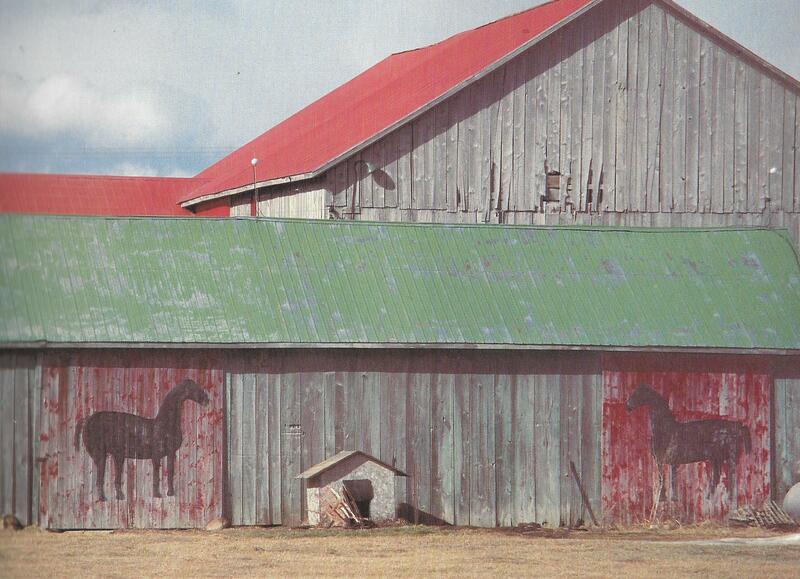 Look at the picture of Tom Culbert’s Black Horses on Red Doors. If you drove by there every day it would pretty much look the same, but go away for twenty years, and you may come back to bare wood. Huron County winters are harsh. You can see that Mother Nature has already erased about 40% of the paint. In the photo notes it says that he painted the doors first in the 1960’s “even before I married my wife”, and has repainted them about five times. Remember this was 1991. Is Tom still around and willing to put on a fresh coat? Of course for many of us the wear is an integral part of the appeal. That’s another reason photo documentation is so important. Things fade away. It’s either that, or you manage to buy them from Tom and have a room big enough to display them in, and then of course you are completely taking them out of their original context. 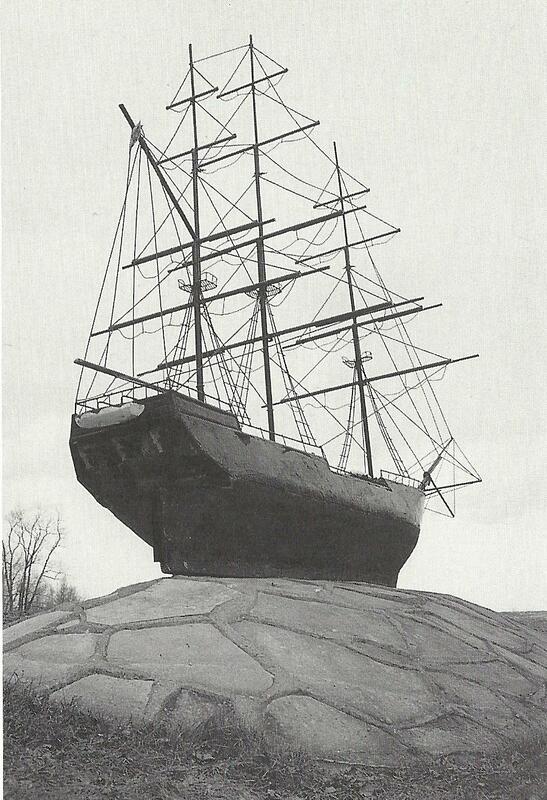 Just look at that 2 ½ ton concrete clipper ship built by George Becker in the 1970’s, and owned by John and Wilfred Tiesma. It stands at the end of their farm laneway, permanently dry-docked atop a fieldstone mound. (12’x 3’ x 15’) You don’t expect to see that when driving down a country lane. It’s on the map along with 35 other points of interest. 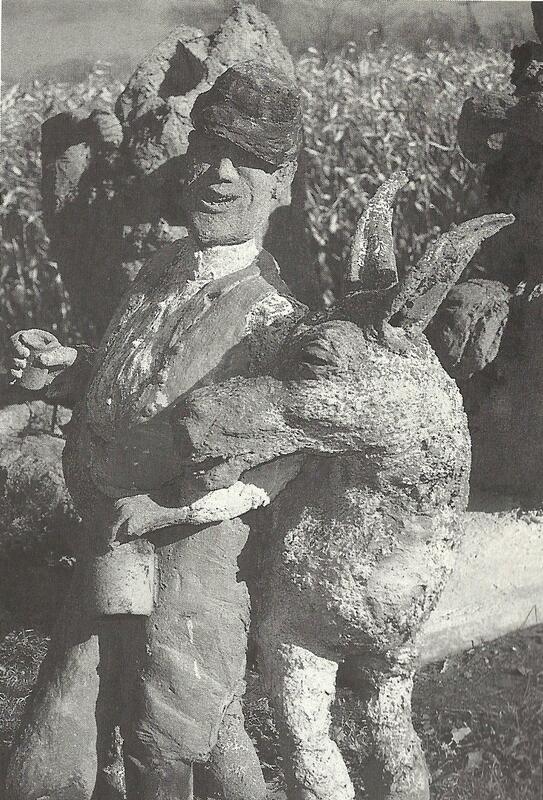 And then, of course, inevitably we come to the cement work of farmer George Laithwaite (1873-1956). 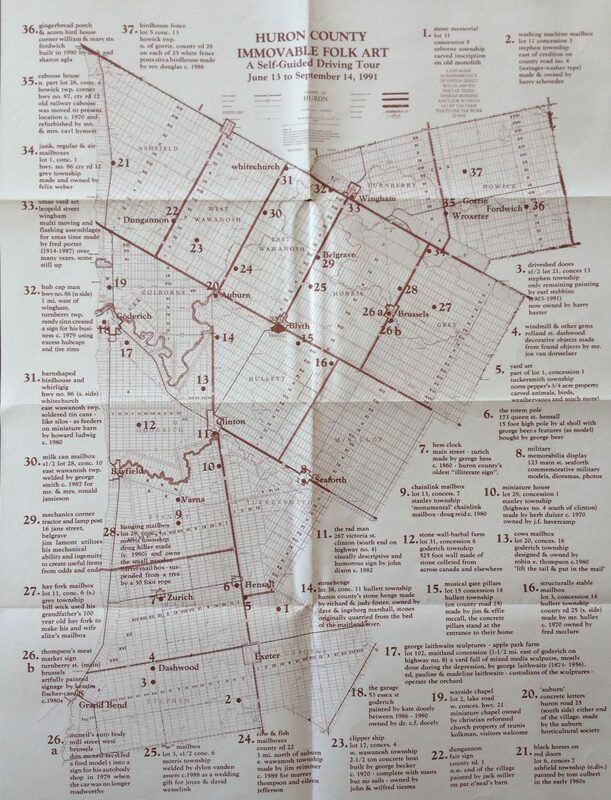 The Laithwaite Apple Park Farm near Goderich has, for three generations fascinated visitors with it’s many sculptures fashioned from cement, metal, fieldstone, and found materials, made mostly during the depression. It’s still open to this day. For the serious folk art devotee it is Mecca. Admission is free and there is a farm market. Do I hear “Road Trip”? 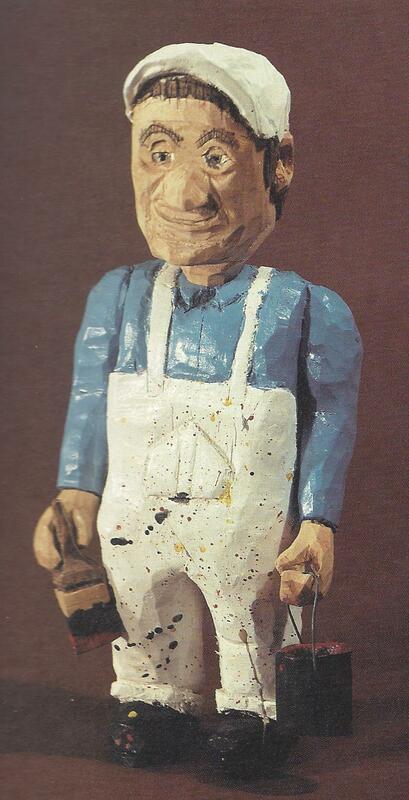 This entry was posted in Canadian folk artists, Historical folk art, Ontario folk art and tagged art brut, art populaire, Bud Oke, folk art animals, Folk Art treasures of Huron County, George Becker, George Laithwaite, Huron County, J. Herbert Neill by shadflyguy. Bookmark the permalink.